I’ve teamed up with Armani Jeans for a really cool collaboration. This September, Armani Jeans is hosting an amazing event in five different European cities: London, Rome, Cologne, Berlin and Antwerp. And that’s where I step in. 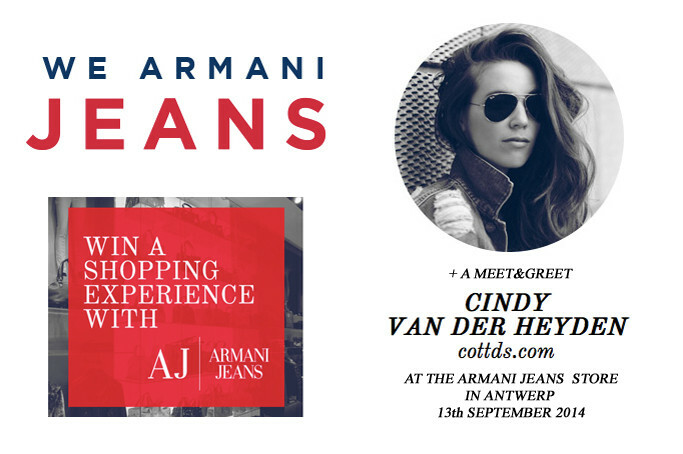 I will be present at an in-store event at Antwerp’s Armani Jeans store – hanging around for a meet and greet with you guys! So save the date and schedule in a big shopping trip in Antwerp on the 13th of September and come say hi! I will be waiting to meet you all! Of course, that’s not the only thing that will be going on in the Armani Jeans Antwerp store (or in any other Armani Jeans store in the other cities!). There is so much more to do during the event, but I have to admit, the best part is definitely the competition. Are you ready? 180 lucky ladies (or men!) will win an exclusive shopping experience with their own Armani Jeans stylist. All you need to do is sign up on wearmanijeans.com and keep your fingers crossed to experience that A-list treatment in the Armani Jeans store! Jammer dat het zo ver weg is (al is het natuurlijk wel een leuk excuus voor een dagje shoppen in Antwerpen) anders was ik zeker gekomen. Klinkt heel gaaf! Alvast veel succes en plezier die dag, babe!